NM0S’s Cylcone 40M QRP transceiver. Look for it at Four Days in May! 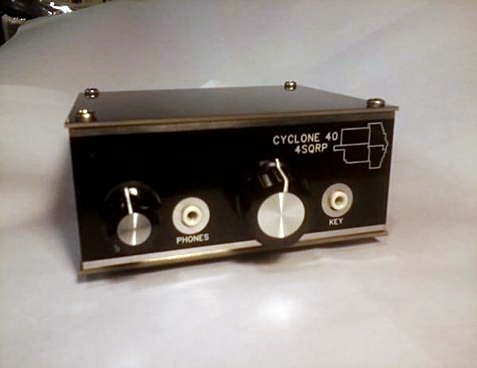 Arising from Dave’s entry in QRP ARCI’s 72 Part Challenge Design Contest in 2010, the Cyclone 40 is an enhanced version of the original design. The transceiver designed for the design contest had 72 total parts, performed well, and won honorable mention. This improved version has less than 100 components and even better performance! The kit features all through hole parts and easy assembly. The receiver is a superhet design with very good sensitivity and selectivity, and tunes the entire 125 kHZ CW segment of the 40M Band – and does so at a comfortable tuning rate. A frequency readout is included so you know where you are at all times. This is a complete kit, including the enclosure. A high quality board package includes the pc board, front and back panels, the sides, and top and bottom all of which make up the enclosure. The control and jack labels are silk screened in white letters and vividly contrast with the black solder mask, and the holes for the connectors and controls are pre-drilled. The ends are “dovetailed” together making a very rugged, easy to build, and attractive enclosure. Enclosure: A very nice predrilled and silkscreened enclosure is included. It’s easy to assemble and looks great. Ergonomics: Smooth solid tuning, a quiet receiver with QSK and well behaved AGC. Nicely laid out front and rear panels. AGC: Audio derived, fast and smooth. Frequency Range: 7.000 – 7.125 typical. Tuning Speed: 10kHz/knob turn typical. Stability: 300 HZ the first 5 min after power up, less than 10 HZ/hour after that. QSK: Fantastic QSK! Full Break in, excellent muting, really fast! All Through Hole Parts There are NO SMT parts in this kit, and only three easy to wind toroids. Configuration: Superheterodyne, 11 MHZ IF, 4 Crystal IF Filter. Sensitivity: MDS (Minimum Discernable Signal) -125, Typical, below the normal 40M band noise level. IMD3: 90 dB typical, better than most commercial gear! Frequency Readout: 3 or 4 digit CW, 1 kHz or 100 Hz resolution (user selectable), developed by Adrian Hill, KCØYOI. DC Current consumption: 30 ma typical at 13.6 VDC. Configuration: Stable, Wide Range VFO (PTO design), Efficient Class E Final. Spectral Purity: All harmonics and spurs less than 50dB below the carrier. DC Current consumption: 500ma typical at 13.6 VDC Will operate down to 9v DC. Kits should be available at QRP ARCI’s Four Days in May conference at Dayton, and will be for sale on the Four State QRP Group’s web site approximately May 20th. The final price hasn’t been determined yet but should be less than $100 plus shipping. This entry was posted in Announcements, Hamvention, Kits, Product Announcements and tagged David Cripe NM0S, Dayton Hamvention, FDIM, Four Days In May, Four State QRP Group, NM0S, QRP. Bookmark the permalink.